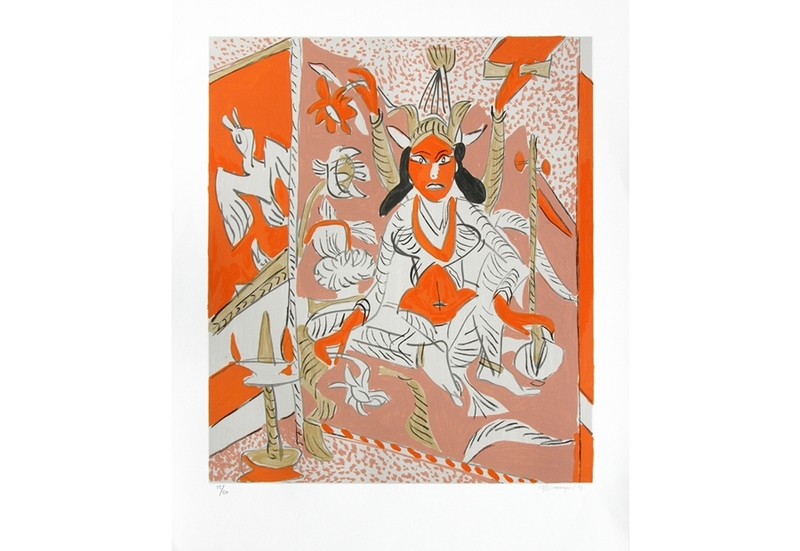 Image Size (H x W): 36" x 30"
Medium:Serigraph on Paper in 31 colours.. Edition of 60. >K G Subramanyan, born in Kerala on 1924. He graduated in Economics from the Presidency College in Chennai and from Kala Bhavan in Santiniketan in 1948, where he studied under the great artists Benode Behari Mukherjee, Nandalal Bose and Ramkinkar Baij. In 1955, he was the recipient of a British Council Research Fellowship at the Slade School of Art at the University of London. He was a multi-faceted person, highly regarded as a painter, writer and art history teacher. He has held over 50 solo shows and has left behind a rich legacy of artwork created in a multitude of mediums. Deeply rooted in Indian traditional values, he nevertheless cowed down to no one and always called a spade a spade. He was an inspiration to several batches of students both in Baroda and at Shantiniketan.K G Subramanyan passed away in 2016 at the age of 92.